MAILED THIS RECIPI TO MY DAUGHTER, BUT MY PRINTER IS NOT HERE. BUT I CAN’T “PIN”” IT. I HOPE I CAN FIND IT AGAIN. WHY DON’T YOU HAVE PIN????? I have the pin buttons on the blog posts. If you hover over the photos you’ll see the big “P” for pinning the recipes. THNX SUDESHNA, FOR HELPING ME OUT HOW TO COOK KATLA MAACH,I GOT RECENTLY MARRIED AND MY HUSBAND LOVES TO EAT REHU AND KATLA FISH BUT I DID’NT KNW HW TO COOK THEM,I HAVE MANY OF MY FRNDS HELPNG ME OUT HOW TO COOK BT I DID’NT FOUND IT INTERESTING. BUT AFTER TRYING OUT UR RECIPE I FEEL HAPPY AND DELIGHTED B’COZ MY HUSBAND LOVED IT AND HE WAS SURPRISED D WAY KATLA MAACH WAS COOKED BY ME. THNX ALOT. JUST ONE SIMPLE ADVICE CAN I USE 2-3 GARLIC PODS FOR THIS RECIPE? Definitely you can use any other cooking oil. This is a wonderful simple recipie that I relish so much..love all your recipies and have tried them too.. Thanks for your comment, it means a lot to have feed backs from our readers. Do come back. Let me thank you for walking me through the instructions! This came out wonderfully well…. and I was cooking for some bengali friends at that! 1. Does this not use panch poran? 2. I see a red chilly in the picture? Is it really there or is it just my whim? 3. I have seen Bengalis use a lot of green chillies (kaccha logka) in their cooking… Not required here? 4. I see my bengali friends always applying turmeric and salt to fish and the potato before frying. Is that not needed? Panch phoron though used often in Bengali cuisine, is not used here. It depends on the preparation and is mainly used in vegetarian recipes. As we are using the dry chili powder here, kancha lanka (green chili) is not needed. 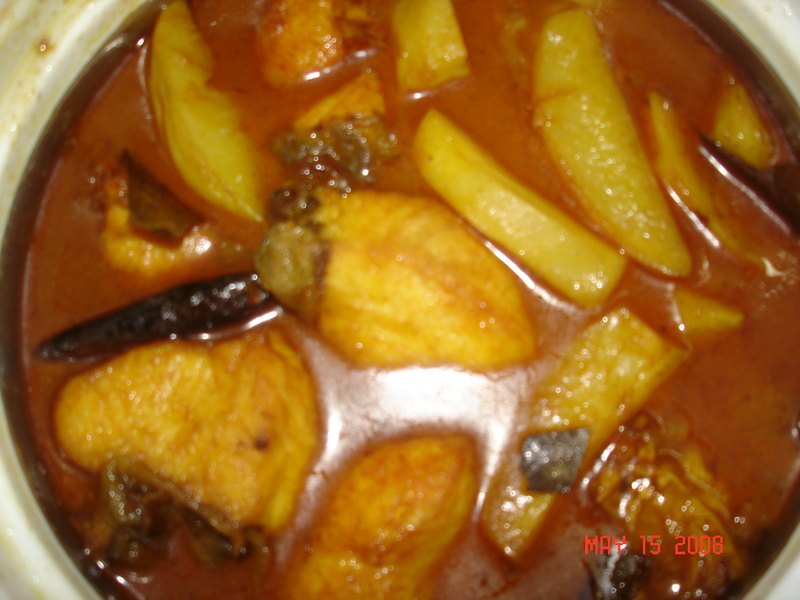 You can use it to prepare the less spicy fish curries like this Hilsa preparation. Yes, it is required to apply turmeric and salt to the fish before you fry those. 2. I assume that the 1/2 tsp given by you for adding to the broth. When is that to be added? 4 pieces of fish require about 1 teaspoon of turmeric powder and 1/2 teaspoon of salt before frying. While you fry the onions you can put 1/2 tsp of turmeric powder, 1 tsp chili powder, 1tsp cumin powder to a small bowl and make a smooth paste with 4 – 5 tablespoons of water. Pour this paste to the fried onions in the wok and then fry a little more and pour in the 2 cups of water. This technique is advised as I presume you are new to cooking and you may probably burn the dry spices while frying. As you add the potatoes and water, add the salt (around 1 tsp). Don’t hesitate to taste and add little more salt if required :). I hope this helps. Please do let me know if you any more assistance. Thanks for providing the recepies, we really required in uganda. Good job u people doing. The first stage when you say half fry the fish and potatoes, do we put any spices on them? and do we fry in extra oil to the amount you have stated? When you fry the fish and potatoes, its not required to put any spices at all. Spices are added only while preparing the gravy, so don’t worry about that. I like to cook in very little oil, as my family members are very averse to oily food. If you like you can cook it with little more oil than specified. Bengalis can’t just feel happy giving a 10/10 for machel jhor. When I was a kid, I had to have at least one piece of fish a for each meal, so even if there was chicken or anything else at home, my mom had to cook fish everyday :). Thanks a lot!!!!! This tastes exactly like my Maa’s recipe.